Gregg Zaun began Spring Training in the San Diego Padres camp but soon decided it was his time to retire. 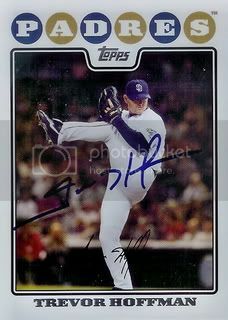 He signed this card for us at the Padres Spring Training Fan Fest just a few days before he made the announcement. Thanks, Gregg. Former Reds ace, Aaron Harang is another new addition to the San Diego Padres this year. It's been awhile since I saw Aaron when he was with the Oakland A's. He was nice then and still is. Another nice addition to our 08 Topps set. I'm not really into collecting signed books. Yes, I know this is the second signed book I've posted this month. What can I say? I like a good deal and this was definitely a good deal. A few weeks ago Barnes & Noble had autographed copies of Cal Ripken Jr.'s new children's book available on their website. I couldn't pass up an autograph of one of my favorite Hall of Famers for $15. The two books I ordered arrived on Friday and they look great. I kept one for myself and surprised my Dad with the other. Not too bad. 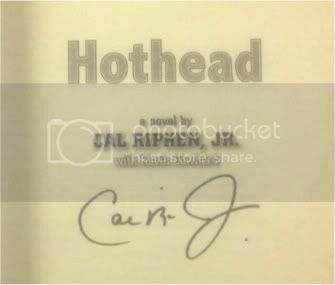 If you're interested there are a ton of signed copies of Hothead on eBay right now and most are selling at pretty reasonable prices. 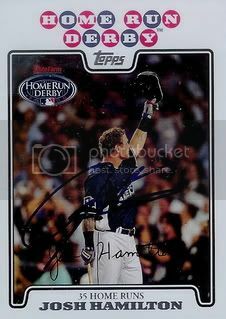 We got lucky this year and were able to finish off the last three Josh Hamilton cards for our 08 Topps set. 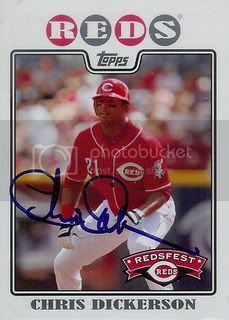 The final card we got signed was his Classic Combos card with Detroit Tigers All-Star Carlos Guillen. Trevor Hoffman has always been a nice guy. 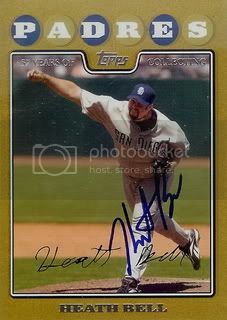 When I got back into collecting autographs around 1999, he was one of the best signers on the Padres. 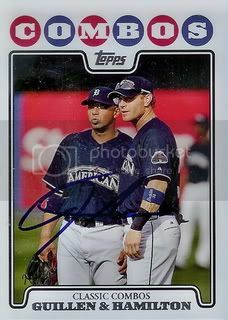 He signed this 08 Topps Opening Day card for us over in Peoria at their Spring Training Complex. He is still as great as ever. Thanks, Trevor! 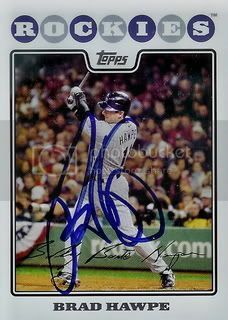 Yesterday's post seemed like the perfect segway to our 394th signed 08 Topps card. 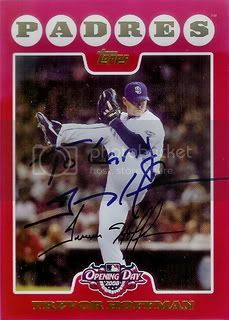 Future Hall of Famer and the current All-Time Saves leader, Trevor Hoffman has been hanging around the Padres Spring Training camp alot this year. We caught up with him the other day and he signed a card for our set. Thanks, Trevor! 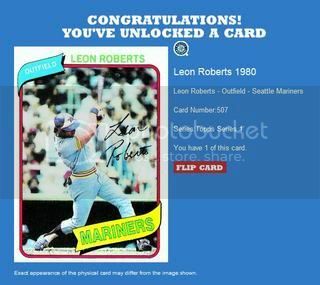 Last week Daniel from It's Like Having My Own Card Shop posted a few cards he had available for trade. 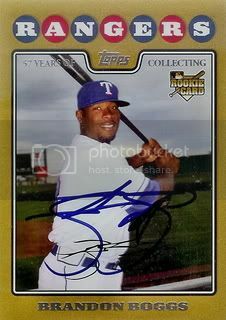 I saw a card with the familiar 2008 Topps bubbles on it but it wasn't an 08 Topps card. 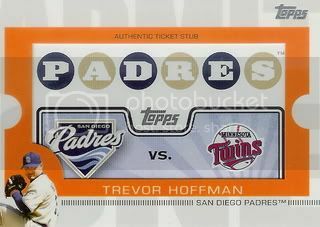 It was a Trevor Hoffman card from the 2009 Topps Ticket to Stardom set with a piece of a ticket stub. 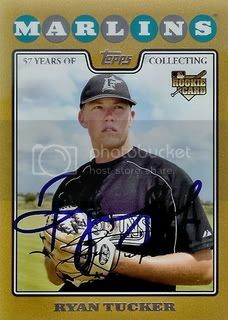 I didn't know the Padres used the 08 Topps design on their ticket stubs that year. Very cool. 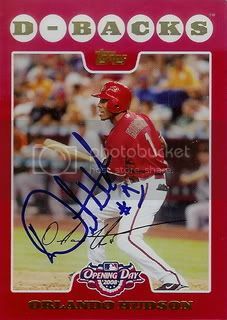 Daniel was nice enough to trade it to me for a Brandon Webb jersey card and a few other D-Backs. Thanks, Daniel. This card is awesome! I like Orlando Hudson and I'm glad he's on the Padres. I heard he may even be their number three hitter this year. Yah the Padres will probably have a difficult time scoring runs in 2011. Hopefully their pitching can carry them to the division title. 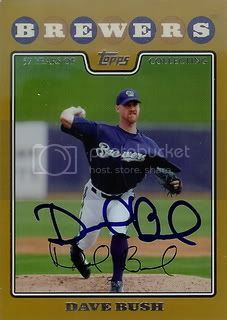 O-Dog recently signed an 08 Topps Opening Day card for us. 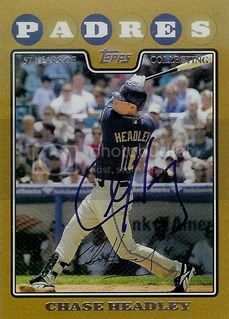 One of the guys who has been wearing a Padres uniform longer than most of the other current San Diego Padres, Chase Headley signed a Gold Border Parallel card for our collection. 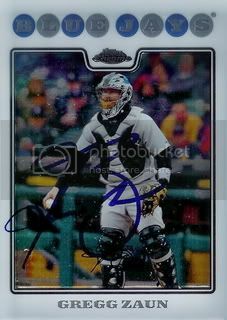 Here's another card I was really hoping to come home with signed when we visited the Brewers Spring Training facility. 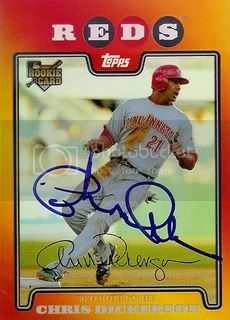 Chris Dickerson signed his card from the Redsfest Team Set. 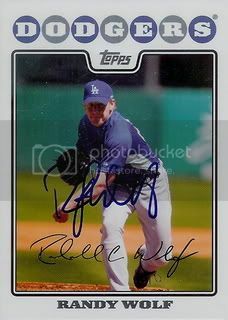 Another former Dodgers pitcher who is now with the Brewers. 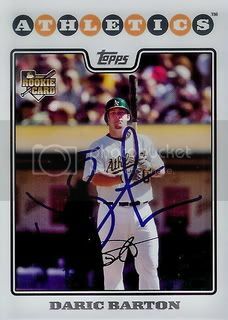 Randy Wolf signed his card from Series One of the 2008 Topps Set. 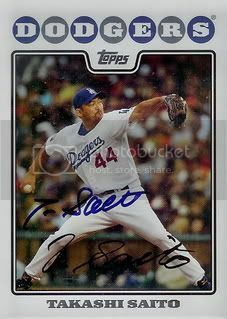 Back in 2009, he signed his card from the Updates & Highlights set for us. 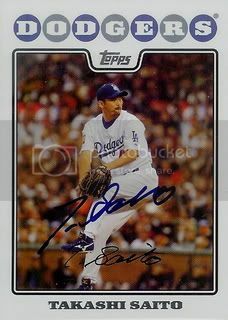 The Milwaukee Brewers signed former Dodgers closer, Takashi Saito this off season. Not sure where he fits in with the club. I guess he's a veteran presence to back up John Axford if necessary. Either way, I'm glad they brought him to camp this Spring Training. 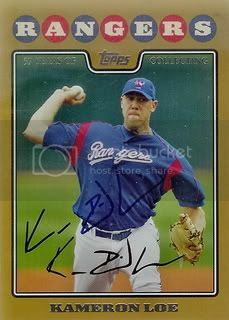 Here's another former Texas Ranger who is now with the Milwaukee Brewers. It's also another signed Gold Border Parallel card for our collection. This one is of reliever Kameron Loe. Former Texas Rangers outfielder, Brandon Boggs is over in Maryvale at the Milwaukee Brewers camp this year. We caught up with him recently and he signed his 08 Topps Gold Border Parallel card for us. 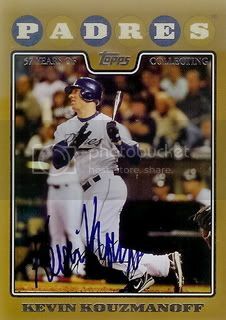 Here's another 2008 Topps Gold Border Parallel card we've been able to get signed this Spring Training. This one is of Oakland A's third baseman, Kevin Kouzmanoff. David DeJesus's Blue Refractor from the 2008 Topps Chrome set is a great looking card. Unfortunately he didn't give us his greatest autograph. David did scribble something on our card. He was walking and had me hold the card while he signed it. Not too bad I guess. Here's another base card for our set. We caught up with Daric Barton at an Oakland A's Spring Training practice a few days ago. He signed his card from Series One of the 08 Topps set. 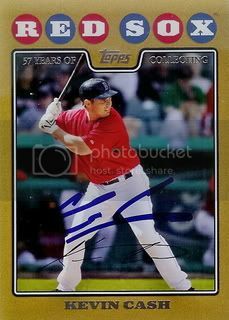 When I saw Kevin Cash's name on the Texas Rangers roster I was excited because I knew I had three different 2008 Topps cards for him to sign. The final is the Gold Border Parallel version of his card from the Updates & Highlights set. 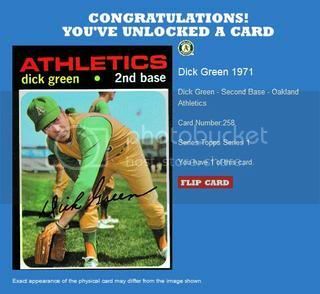 This Spring, we've been able to add a good number of signed Gold Border Parallel cards to our collection. Here's one that Ryan Tucker signed for us. I don't think it's a big secret but I'm a HUGE Simpsons fan. It's probably the one thing I like as much as baseball. On February 20, 1992 Matt Groening & the Simpsons writers brought my two favorite things together in the classic episode entitled, Homer at the Bat. Nine of the biggest names in baseball were brought in as guest voices. 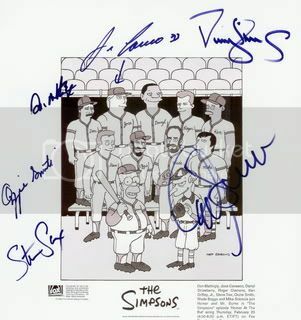 About five years ago, I bought a press photo from the episode and decided to try to get it signed by all of nine players. I caught up with Mike Scioscia at an Angels Spring Training game. Ozzie Smith at a taping of a television show. Jose Canseco at a paid signing. Darryl Strawberry was another paid signing. Don Mattingly at a Dodgers Spring Training practice last year. On Friday, I was able to get the sixth player to sign my photo. 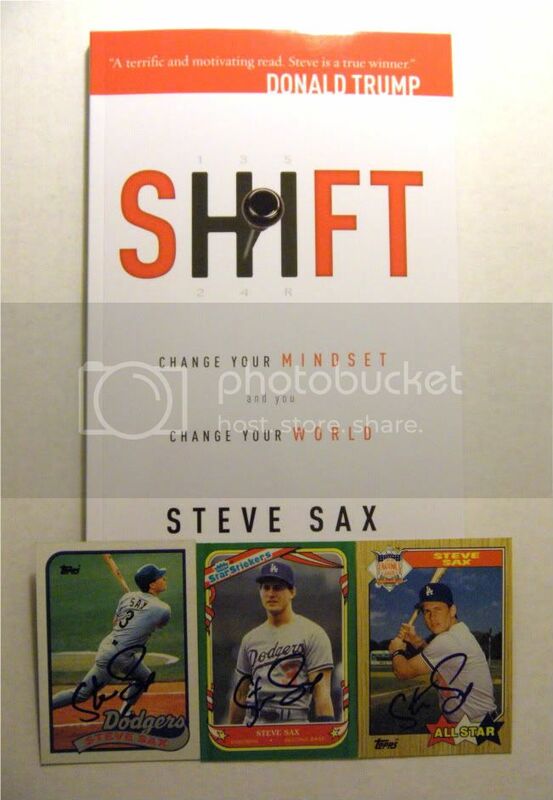 This was the main reason I went to the Steve Sax book signing. Out of all of the autographs in my collection, this is by far my favorite. With six down, I have just three more players to go. 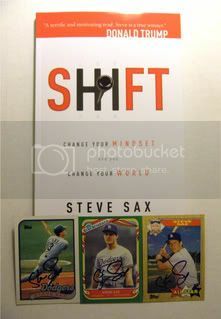 The past few days former Los Angeles Dodgers second baseman, Steve Sax had a few appearances scheduled around the Phoenix area. On Friday, I made my way over to Antar's Sports Bistro to see him. It was supposed to be a book signing but of course I brought along a few extra things just in case. The three hour signing was scheduled to start at 3pm. I chose to be fashionably late and showed up about thirty minutes after the start. I was the only person there. 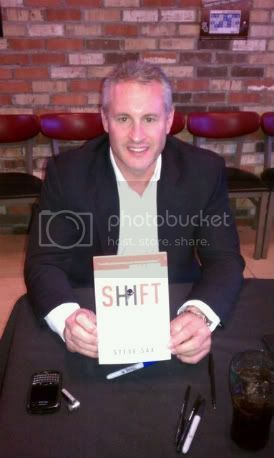 I paid $22 for a copy of Steve's book, Shift. If you're interested, they're available on Amazon for around $14. While he signed my book, he talked to me for a few minutes about the new telecommunications project he is launching in Phoenix. Since I was the only one there, I decided to press my luck and see if I could get additional things signed. He didn't seem to happy about it but I did walk away with a few signed cards. The cards & book were great but check back tomorrow to find out the real reason I went to this signing. One of my favorite memories of the 2008 season was the Home Run Derby. Josh Hamilton stole the show. Most people probably don't even remember that Justin Morneau actually won the thing. This card does a great job capturing that amazing night. It's even more great now that Josh signed it for us. 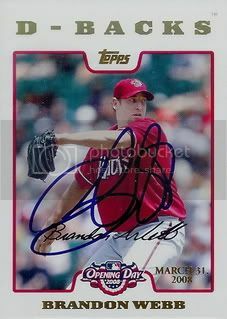 Former Milwaukee Brewers starting pitcher, Dave Bush is now with the Texas Rangers. 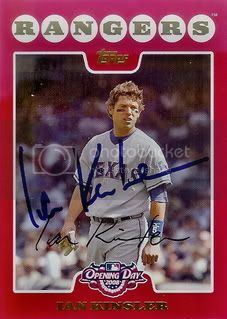 Two years ago he signed his regular 08 Topps card for us over at the Brewers camp. This year he signed the Gold Border Parallel. 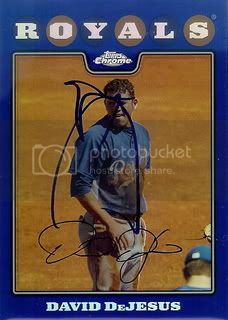 One of my favorite players, Ian Kinsler signed his Opening Day card for us during a Spring Training practice the other day. Thanks, Ian! 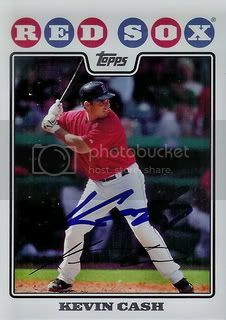 In addition to his regular 2008 Topps card, Kevin Cash also signed his card from the 55 card Boston Red Sox gift set. It looks almost indentical to his regular card but its cropped just slightly different. You can see more of his shoes in this one. 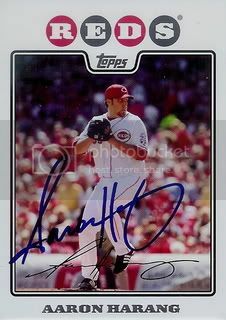 Starting March off with a signed card of the 2006 National League Cy Young award winner. Brandon Webb signed with the Rangers this off season as a free agent. After missing almost two full seasons, it would be nice to see him back on track. Unfortunately everything I've heard so far points to him not being ready for Opening Day. This is the first 2008 Opening Day White Border Parallel card that we have gotten signed. These are pretty cool and are numbered to only 2199.